What is a Montana Last Will and Testament? 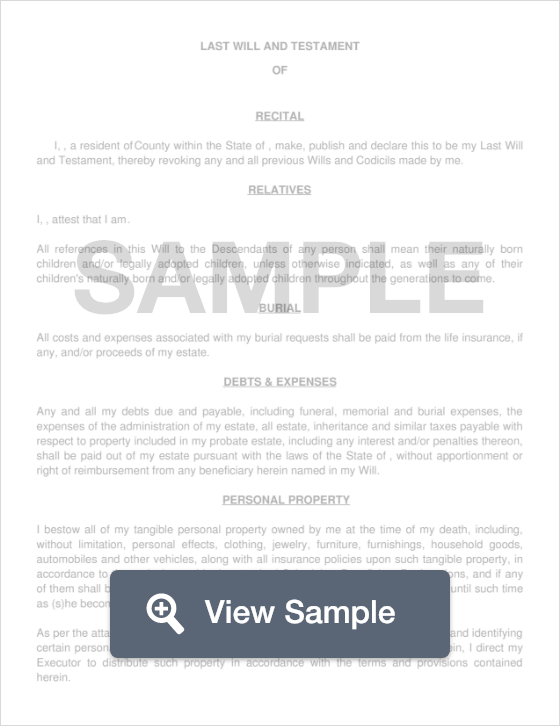 Montana Last Will and Testament: What Is It? In Montana, a Last Will and Testament is a legal document that declares how a Testator (the person creating the Will) wishes to distribute his or her assets once he or she dies. A Will will provide exact specifications as to what percentage or amount of assets will go to each beneficiary. A Will can also dissolve property and assets to charity and friends, in addition to children and spouses. In order to be legally recognized by the state of Montana, the Will must be signed by two Witnesses as well as a Notary Public. Witnesses - According to §72-2-522, the Will must be signed by two (2) witnesses. Unless you are single, provide the name of your spouse and whether or not he or she will be named as a beneficiary. Step 5 - Indicate whether or not you’d like to set up a Trust for someone. This is often a good idea for those who may suffer from a mental illness or disability and requires special care. Setting up a Trust for them can prevent any eligibility issues with them receiving other aid such as Medicaid or Supplemental Security. When will your children begin receiving their inheritance? When will their inheritance benefits end? What portion will they receive? Step 7 - Provide the name and address of the funeral home you’ve made arrangements with. Step 8 - State any last wishes that you have in regards to the last meal after the funeral service. Step 13 - Additional Beneficiaries - If there are any additional beneficiaries, or charities that you wish to leave your belongings to, be sure to name them in this section. Now that your Will is complete, be sure that all parties sign the document, and that a Notary Public notarizes it. Remember to send one to your attorney as well as your beneficiaries so that everyone may have a copy.